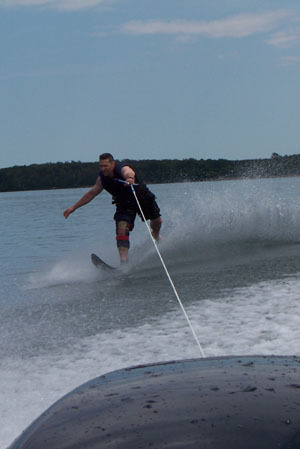 Summer reminds me of waterskiing the beautiful lakes and rivers in Minnesota. Walking out of work after another thick day, “let go of the rope” came to mind. When you start losing your balance waterskiing, you naturally let go of the rope so you don’t get pulled under and dragged along. A vivid reminder of releasing and letting go of the day, finding a renewed balance. We think that we should hold tight no matter what, even if it drags us under. There’s no heroism or strength in stupidity and stubbornness. When you get off balance and start to fall, let go of the rope. You’ll float. Remembering this and reminding myself of this daily. Thanks! Love this. So true. Though we are so afraid to do it. And when we take the first step out and do it we know its true. I love your pearls of wisdom!! Maybe more rocks than pearls. Enjoy the day! I needed that advice today. My posts are me talking to myself to remind me what’s important when I forget. When they resonate with others, it’s more proof that we all have things in common – struggles and victories. Letting go, is a way of finally surrendering and trusting! It is in the trust that we can finally breathe. Thank you for this. m.
Great insight – thanks for sharing! Great insight – thanks for sharing.